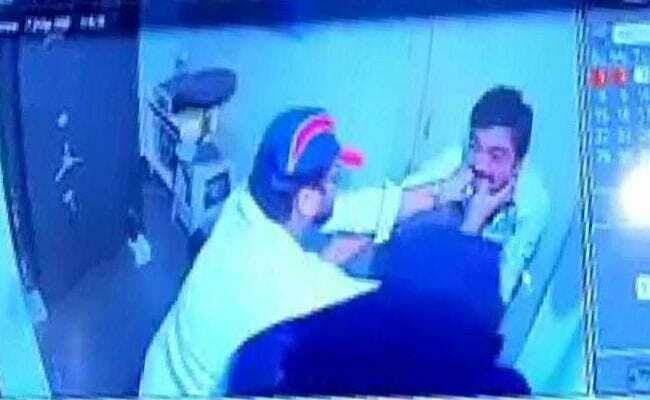 A dramatic CCTV footage has emerged from a jewellery shop in Hyderabad's Beeramguda, which shows the owner fighting a couple who tried to loot his shop on Wednesday. Jayaram, 32, the owner of Jai Bhavani Jewellery nearly overpowered the couple after a long fight but could not stop the robbery apparently because one of the robbers threw chilli powder in his eyes. The couple entered the shop a little past 9 pm, posing as customers and wanted to see some jewellery. Jayaram showed them a variety of ornaments for over 45 minutes said the police. Later he went into the strongroom to take out more jewellery, when the couple followed him. The CCTV footage inside the strongroom shows a masked man threatening Jayaram with a gun. A woman in a burqa can be seen punching and hitting Jairam with a stick. The fight went on for more than ten minutes and Jayaram nearly overpowered the couple. A little later Jayaram can be seen writhing in pain with his hands on his eyes. The robber couple fled with jewellery worth Rs 25 lakh and Rs 4 lakh in cash said the police. The police believe the weapon that can be seen in the footage was probably a toy gun as the man never used it. The robber couple is yet to be identified as their faces were covered said the police. The CCTV footage is being analysed and copies have been sent to other police stations in the State. The jeweller has been admitted at a local private hospital. The police believe one of the robbers is also injured as he can be seen covering his bleeding nose with his hand while fleeing.